Discounted tickets for Family groups of 4 (2 adults, 2 children) Available here! Off-Peak dates (1st – 8th) Available Here! All aboard the Elf Express to Elf Tower! Venture though the Magical Elf Forest where you will be greeted by 3 very cheerful elves. Each elf will be waiting with a sweet treat or two for you to take away- but of course, that is only if you have been good this year!! Then climb the winding staircase to meet Santa for a Christmas story and present! This is set to be the best Christmas experience yet, so don’t miss it… even the adults get treats! You may arrive at the Park at any time, but please take into account your booked Elf Express Ride time. You will need to arrive at the departure point no later than 10 minutes before your chosen time slot. 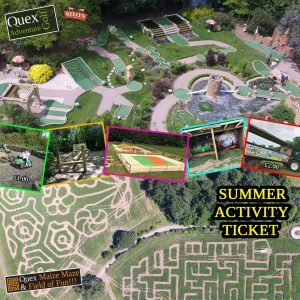 Departure point is at Quex Barn and please follow signs for parking.